Yale University Press, 9780300105711, 192pp. 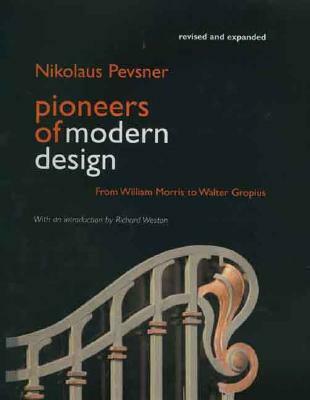 One of the most widely read books on modern design, Nikolaus Pevsner’s landmark work today remains as stimulating as it was when first published in 1936. This expanded edition of Pioneers of Modern Design provides Pevsner’s original text along with significant new and updated information, enhancing Pevsner’s illuminating account of the roots of Modernism. The book now offers many beautiful color illustrations; biographies and bibliographies of all major figures; illustrated short essays on key themes, movements, and individuals; a critique of Pevsner’s analysis from today’s perspective; examples of works after 1914 (where the original study ended); a biography detailing Pevsner’s life and achievements; and much more. Pevsner saw Modernism as a synthesis of three main sources: William Morris and his followers, the work of nineteenth-century engineers, and Art Nouveau. The author considers the role of these sources in the work of early Modernists and looks at such masters of the movement as C.F.A. Voysey and Charles Rennie Mackintosh in Britain, Louis Sullivan and Frank Lloyd Wright in America, and Adolf Loos and Otto Wagner in Vienna. The account concludes with a discussion of the radical break with the past represented by the design work of Walter Gropius and his future Bauhaus colleagues. Nikolaus Pevsner (1902-83), a distinguished scholar of art and architecture, was best known as editor of the 46-volume series "The Buildings of England" and as founding editor of "The Pelican History of Art." Both of these prestigious series are currently published by Yale University Press. Richard Weston is professor at the Welsh School of Architecture, Cardiff University. He has published extensively on twentieth-century architecture, including his book "Materials, Form, and Architecture," published by Yale University Press.